We looked at the top 10 Hand Blenders and dug through the reviews from 124 of the most popular review sites including Coffee Maker Review, Best Reviews Guide, Your Best Digs, Blender Reviews, Master Training 365, Tech Purchases and more. The result is a ranking of the best Hand Blenders. Our experts reviewed the top 10 Hand Blenders and also dug through the reviews from 124 of the most popular review sites including Coffee Maker Review, Best Reviews Guide, Your Best Digs, Blender Reviews, Master Training 365, Tech Purchases and more. The result is a ranking of the best of the best Hand Blenders. With 15 variable settings and dishwasher-safe parts, the Breville Control Grip Immersion Blender includes many features that chefs want. A rubberized handle keeps you comfortable while you're mixing, and the arm comes out easily for simple cleanup. You'll get 280 watts of power to help blaze through even the thickest ingredients. DWYM Kitchen Experts plus BestReviews, New York Times Wirecutter, Blender Critics, Consumer Reports, Techlicious, Engadget and 4 more. Along with user reviews from Amazon.
" 15 variable speed settings." "In our tests, the Breville couldn’t make super-speedy mayo (which involves combining all of the mayo ingredients in the cup and emulsifying them with the blending wand)." The handle of the Braun Multiquick Hand Blender boasts an ergonomic design to keep you comfortable while you're blending. The mixer resists spattering to keep your kitchen clean. Stainless steel blades and an extremely affordable price help boost this mixer's appeal. DWYM Kitchen Experts plus BestReviews, New York Times Wirecutter, Best Reviews Guide, Village Bakery, Immersion Masters, Brains Report and 1 more. Along with user reviews from Amazon, Best Buy, Target and Google Express.
" 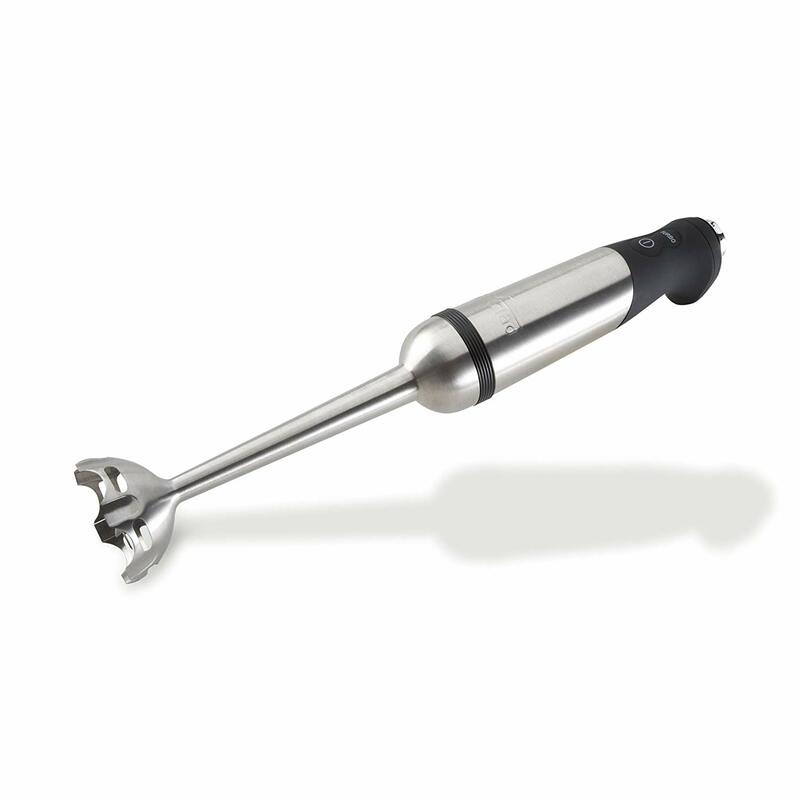 Less expensive immersion blender." "Although you get a mixing cup with the Braun, it’s less than half the capacity of the Breville’s and has no handle so it’s not as convenient to use. You also get a whisk but not a chopper." DWYM Kitchen Experts plus Best Reviews Guide, Your Best Digs, Blender Reviews, Master Training 365, Tech Purchases. Along with user reviews from Amazon.
" Bamix has a unique four-pin cage that is open at all sides. This design allows food to easily be drawn across the blade." "Not the easiest to clean"
Its extremely low price point makes the Cuisinart Smart Stick CSB-75BC Hand Blender popular with consumers. You'll get 200 watts of power with the motor to help you mix a wide range of ingredients. It only comes with one mixer attachment, but it resists spatter and blends easily. DWYM Kitchen Experts plus BestReviews, New York Times Wirecutter, Consumer Reports, All Kitchen, Recipes For Anything, Blend With Us and 2 more. Along with user reviews from Amazon, Best Buy and Home Depot. "Produced a slightly chunkier puree." We identified the majority of the hand blenders available to purchase. Reviews from our DWYM category experts and analysis of some of the most respected sources including: Coffee Maker Review, Best Reviews Guide, Your Best Digs, Blender Reviews, Master Training 365. We also incorporate user reviews from the leading retailers including Bed Bath & Beyond, Amazon, Best Buy, Walmart, Home Depot, Target, Google Express. We found the blender rather easy and convenient to use. The grip was comfortable and it was quite easy to operate the blender. Right from the unboxing, the Breville Control Grip is impressive, all sleek lines and smart design. It's one of the only models we tried that didn't suction to the bottom of a pot or mixing cup. Easy to detach and dishwasher safe. It features stainless steel blades and an exquisite design that constitutes an 8-inch depth for handling large amounts. It’s light enough to gently stir a drink or heavy duty enough to easily puree your thick soups. In our tests, the Breville couldn’t make super-speedy mayo (which involves combining all of the mayo ingredients in the cup and emulsifying them with the blending wand). However, we have to point out that the grip may not suit people with small hands, as they may find it too large and therefore inconvenient to operate the blender. The Breville generally failed or at lease flummoxed this portion of testing, often requiring a tooth-gritting tug of war to finally free the mixing shaft. It’s irksome, but far from a deal-breaker for an otherwise stellar experience. A little bit heavy and big for handheld blender. This is a high-end blender that comes with a higher price tag. For the Hand Blender category, we analyzed 124 of the most popular reviews including reviews from Coffee Maker Review, Best Reviews Guide, Your Best Digs, Blender Reviews, Master Training 365, Tech Purchases and more. The result is a ranking of the best Hand Blenders.